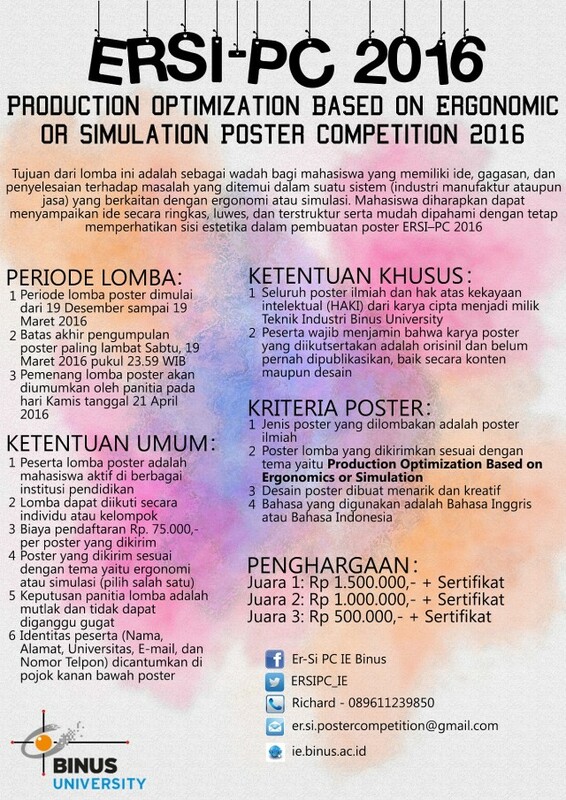 Industrial Engineering in Binus University presents an Ergonomic and Simulation Scientific Poster Competition 2016 (ERSIPC 2016) a national level competition. This competition is open for any undergraduate student. With “Production Optimization” as the theme, the purpose of this competition is to be a forum for student to express ideas, concepts, and how to solve problems that encountered in a system (manufacture industry or service) which is related to Ergonomic and Simulation. The registration and submission is opened from December 19th 2015 – March 19th 2016 and the winner of the competition will be announced on April 21th 2016.